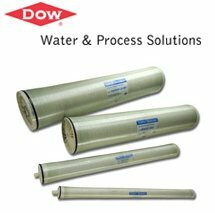 Whether you demand the highest purity water or the lowest cost water production, there is a commercial / industrial Filmtec element for you. Whether you seek the latest high performing and innovative solution or the most cost effective one, our brackish water product line offers the optimal balance of performance, quality, reliability, and cost. Filmtec elements can facilitate maximized system output, improved pure water quality and extended useful element life in your RO water treatment system, and Filmtec elements are more durable and clean more effectively over the widest pH range (1-13) than other (RO) elements. Filmtec high rejection brackish water elements have the highest rejection of solutes critical to the reliable performance of a high-purity water treatment system, including silica, boron, sulfates and ammonium, made possible by the latest innovations in thin film composite membrane chemistry. Advanced membrane polyamide chemistry, enables the highest biological and organic fouling resistance, and is combined with an optimized 34 mil feed spacer design that resists the formation of fouling and reduces pressure drop across the element. Filmtec low-energy / low-pressure products combine optimized membrane chemistry with automated precision fabrication to maximize system output to unprecedented performance. Filmtec elements offer high performance over the operating lifetime without oxidative post-treatments used in many competitive products. This is one reason Filmtec elements are more durable and clean more effectively over the widest pH range (1-13) than other reverse osmosis (RO) elements. Filmtec low energy elements enable operational cost savings through lower energy usage and higher system productivity than other elements. Automated precision fabrication with a 28 mil feed spacer reduces the effect of overall fouling, maximizes element efficiency, and lowers your operating costs. Higher surface area elements permit RO system designs that meet productivity targets with fewer elements. These new designs result in lower installed system cost by reducing the number of components and installation expense. High fouling feed waters need not result in frequent membrane cleaning and replacement. Filmtec fouling-resistant (FR) elements feature proprietary FR membrane technology providing superior fouling resistance and cleanability in both potable and non-potable applications. Automated precision fabrication, using FilmTec's robust fouling resistant membrane and the widest feed spacer in the industry, reduces the effect of overall fouling through optimal leaf-length construction which gives more uniform operating flux. Filmtec membrane offers high performance over the operating lifetime of the element without oxidative post-treatments used in many competitive products. This is the reason Filmtec membranes have the widest pH cleaning range in the industry (pH 1-13), enabling the effective cleaning of scale, organic compounds and biofilm. Combining the industry's most robust membrane with the most advanced fabrication and FR technology, results in fouling resistant elements with the best long-term economics and unprecedented performance. Note: Permeate flow rates for individual elements may vary, and will also be influenced by feed water conditions.